A photograph leans against the marble base. He looks young and blond. The stone is further engraved with images and a poem. New Information on Louis Van Wyck. 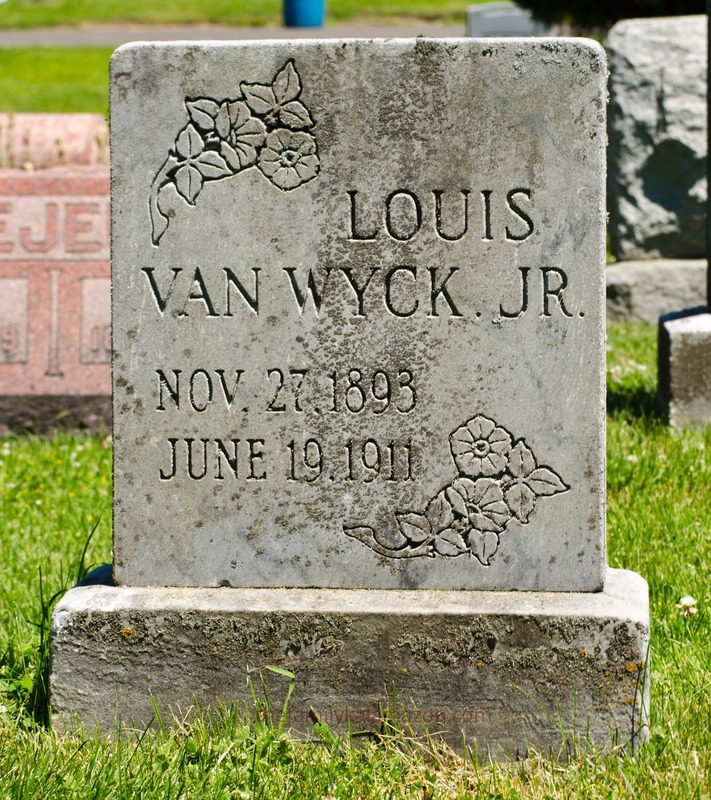 I was frustrated that I knew so little about Louis Van Wyck and yet my grandfather’s uncle had photographed his beautiful headstone with his cornet and photograph adorning it and left it behind for our family. Who was Louis Van Wyck? Many of you offered advice. Pastsmith really went to work on the problem and found Louis’ death certificate and his grave. Things to notice in this death certificate are that he died of “accidental drowning” at Bryant Mill Pond. I looked up Bryant Mill Pond and discovered it is related to the Bryant (Paper) Mill. There were many operating paper mills at that time in the Kalamazoo area, all along the Kalamazoo River and Portage Creek. You can find quite a lot of information online about the cleanup that has been necessary in this area. I can’t imagine what the pond was like in those days. Was it full of papermill sludge or was it a clean pond that begged a boy to come swimming? 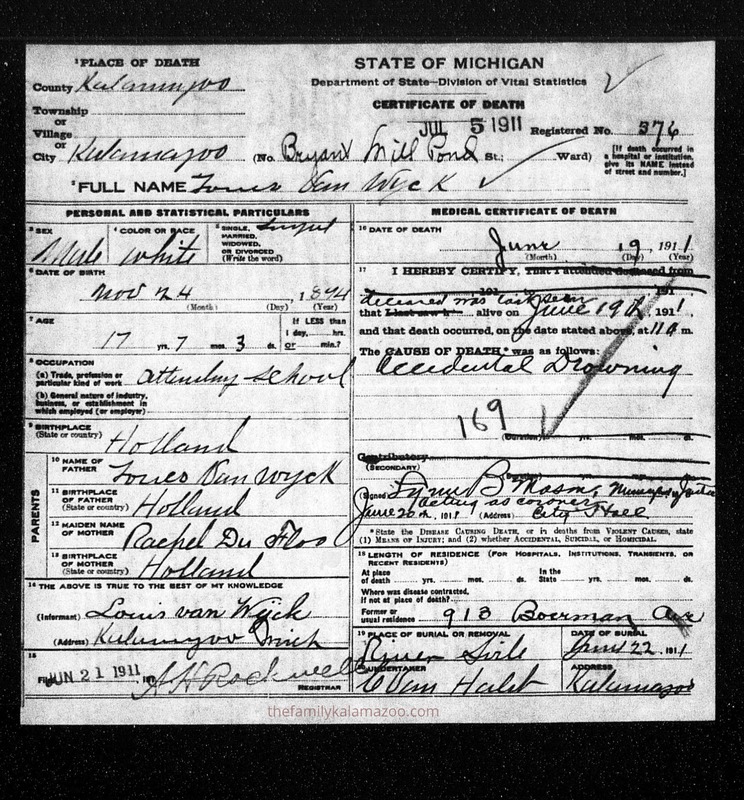 Note that he drowned on June 19, 1911, just at the start of summer. Louis’ parents were both from Holland, his father named Louis also and his mother born Rachel Du Floo. With this information I was able to find the family in the 1910 census, a year before Louis passed away. Louis had two sisters: Mary was 5 years older and his sister Kate was only 5 when Louis died. The senior Louis was a typesetter and worked for a newspaper. I wrote about how some members of my family worked on the Dutch-American newspaper here. Possibly Louis worked with them. In the 1920 census, Louis was listed as a price lister, whatever that is. It’s possible that the newspaper was out of business by then. The family lived at 913 Boerman Avenue. This does not make them neighbors of my family, but it is within a long walk–the sort of walk my grandmother and I used to make when I was little. The house no longer exists as the area seems to be commercial now. Since the families did not go to the same church, Joseph was 12 or 13 years older than Louis, and they were not neighbors, the connection could have been the typesetting. 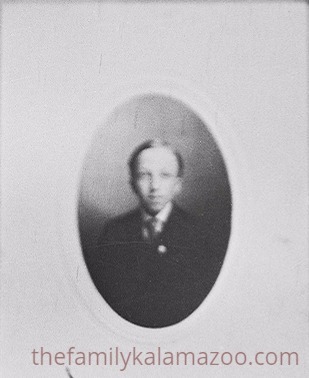 After all, Louis, Sr., was born in the Netherlands and spoke Dutch. It seems that it would have been easier for him to be a typesetter in Dutch than in English. As the death certificate mentions, Louis was buried at Riverside Cemetery. Through Find-a-Grave, it appears that he has another headstone than the one above. Two headstones, one very elegant and detailed and the other more simple, certainly does create a mystery. They also share dates of birth and death. However, Louis’ date of birth is different on his death certificate. There it reads November 24, 1894. Since the simple headstone appears to be the one at Riverside Cemetery, where is the other one or what happened to it? 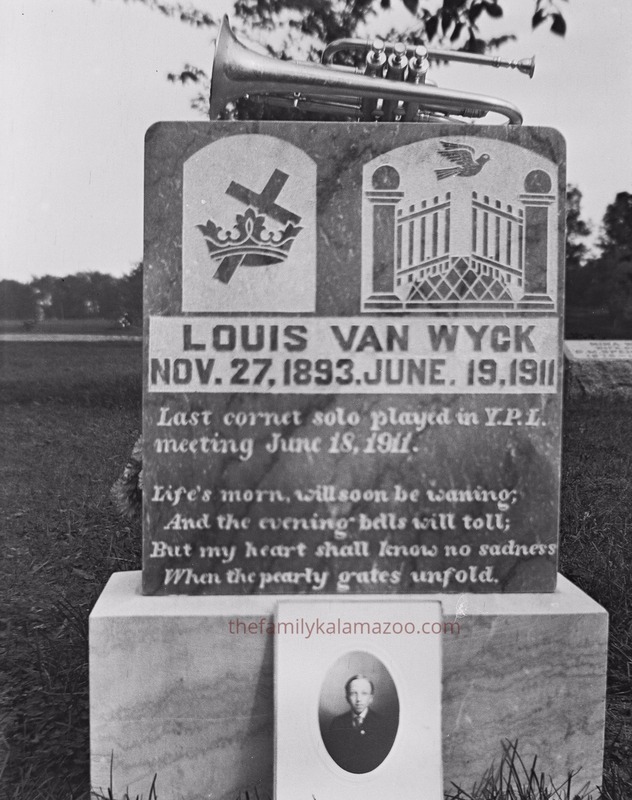 LVW’s sister is Mary A (VanWyck) Fortune, 1888-1976, Find a grave #25812816, Riverside Cemetery, Kalamazoo. 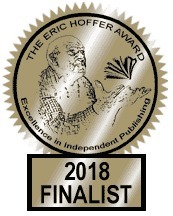 Her husband gave the books which archived “The Young Soldier” publication of The Salvation Army to my mother-in-law, shortly after Mary’s promotion to Glory in 1976. They came into my possession in the 1980’s. I have since forwarded them on to The Salvation Army Central Territory’s Museum and Archives in Hoffman Estates, IL. As for LVW’s two headstones; I am more familiar with the one with the cornet on it. I don’t recall where I’ve seen it before. But I knew it before I saw it in your web site. Perhaps it was in this archive book I had, or in local S.A. archive photos. I would like to see the larger headstone. I’ve also seen the more plain headstone before your web site, I have no explanation for two headstones. The photo of Louis himself is the photo I’ve seen published and in the local S.A. archives, as well as others that are of that era. I came across the actual Band Commission for Louis VanWyke Jr.(Wyck is misspelled on the document) in our local SA archives from 1909. I have a picture of it but don’t know how to present it here. It has renewal comments written on it, renewing it until 1910, 1911, and 1912. Also, on the certificate is printed the name of the current General; William Booth. After Booth’s death in 1912 all subsequent SA documents say, “William Booth, Founder”, and would also list the current General. I also have other anecdotal information regarding Louis’s sister, Mary A. Fortune, from my wife. In the 1960-70’s Mary and Neil Fortune lived next door to my wife’s parents, Richard and Shirley Aukes . . . in Portage, MI. The Aukes’s and Mary were members of The Salvation Army of Kalamazoo, like Louis VW. Neil helped Richard build a garage. Later after Richard’s death in 1968 and Mary’s death in 1976, Neil gave Shirley Mary’s cedar hope chest. The hope chest was given to my wife, who in turn has given it to our daughter Betsy. Besides the hope chest, Shirley received the books chronicling Louis’s premature death. At this point it became clear that Joel is the brother-in-law of my junior high classmate, Chris Aukes. We were in almost all our classes together for the three years of junior high school. Note that Mary Fortune who Joel refers to is Louis’ older sister Mary. 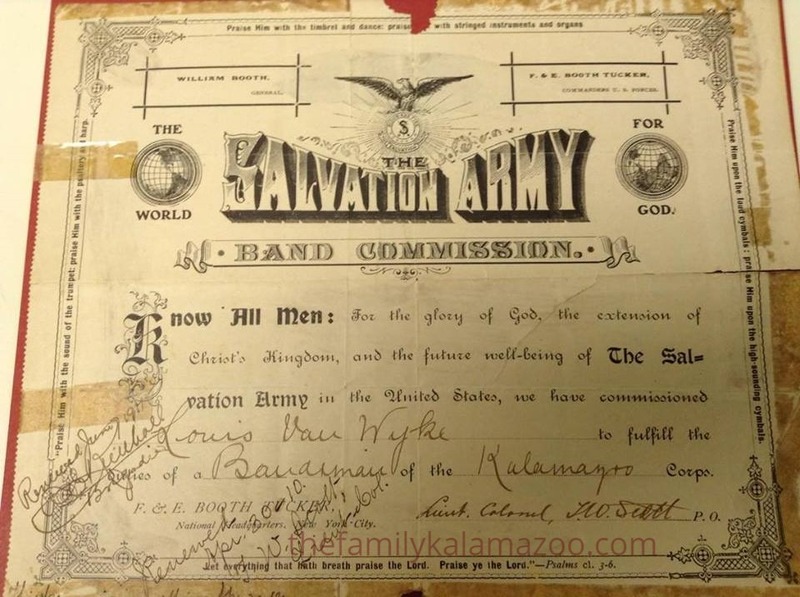 Here is the 1909 Band Commission for Louis Van Wyck that Joel found in the local Salvation Army archives. What talent Louis must have had. I’m so pleased to know more about Louis and hope to find out even more. I tried to blow up the photo that rests against the first headstone. Though it is faded, it does give an idea of what Louis looked like. Although Louis was not my relative, I enjoy finding out more about the history of the people who lived in Kalamazoo over 100 years ago. This is what blogging and family history is all about! I loved reading this post! It’s awesome when you can share and get help from others. Thank you so much! Yes, I love the collaborative work through blogging about family history!!! It makes it more fun and social and provides more info for all! A millpond was a weir on a stream built to provide water to drive the mill. Probably popular for swimming as it would have been deeper than the rest of the river. The Salvation Army was an incredibly important group of people supporting and evangelising the poor in London, and did a lot of information collecting on living conditions to force governments to take action against poverty. The bands were for evangelising but also fundraising. They were brass in order to drown out hecklers. Hope this helps. Barb, your information is so helpful. Knowing that it was deeper is so interesting. What a magnet for kids to flock to! And such wonderful info about the Salvation Army. Thank you so much for your addition! Thanks, Barb. I just followed your blog! Hah, well, that and the generosity of readers like Joel! Great research Luanne. This really IS what family history is all about and I’ve so enjoyed reading your post and learning new things about the Salvation Army in particular. It’s such fun to learn about new things (to me) in this whole research process!!! Wonderful post! So glad you could fill in some of the gaps, and I love how you wrote it up. Now we all wish we’d known Louis. Could the family connection be through the Salvation Army? I am, too. Now if we could just figure out about the two headstones!!! I don’t think that the connection would be through the Salvation Army because the pertinent branch of my family was Dutch Reformed. I didn’t realize the Salvation Army was part of a religious denomination. Shows what I know. And two headstones is really odd. Maybe there was a rift in the family? Salvation Army is an evangelical Christian denomination and charity, a very different religion than Dutch Reformed, which is Calvinist in origin. John Calvin started a form of Protestantism that has a more “straight-laced” image (if you think of the music and emotional discourse of African American Protestant churches and some of the big fundamentalist churches, Calvinist churches are the opposite). He was an arch enemy of Queen Mary of Scots and I wrote a master’s level paper about him ;). Yes, at one time I was a history grad student, specializing in European religious history. I can hardly believe it! I believe it! I know a bit about Calvinism from college, but nothing about the Salvation Army except for the Santa’s ringing bells in NYC and Guys and Dolls! Happy New Year! That was about it for me, too! I find it very interesting learn about the people who lived in the communities where our ancestors lived. Who were the movers and shakers in the community? Which individuals went to the same church? Who was friends with whom? and so on. What an extraordinary story, I’m impressed by your research to put it all together. Although it is sad, it is also lovely that his memory persists and that people all over the work can now spare a thought for him and his family. Thank you, Hilary. Isn’t that the best thing about blogging? !